Hello, lovely readers! It’s been about six months since I began blogging regularly here at Holistic Body Theology, and I’ve decided to take the month of August off from blogging and dedicate the time to praying, planning, and preparing for the future of the blog. Although I won’t be posting anything new, I’ll still be around, so feel free to connect with me and let me know what you’d like to see here in the future. Leave a comment in the box below, or hit me up on Facebook or by email. I would love to hear from you. In the meantime, here are some of the most popular posts from the past few months to tide you over until I get back. Conversation: Are You an Ender or a Starter? People are creatures of habit. We like to be comfortable and content. We like met expectations. We like sameness. But Christ did not call us to comfort and contentment, sameness or habit. We are called to more than the status quo, more than what is easy and accessible. We are called to go. We are called to give up. We are called to drop and follow. We are called to run. We are called to be bold. We are called to be counter-cultural. We are called to be subversive. We are called to live in tension, in paradox. We are called to more. Since moving to a new area and starting over again to find a community to participate in, my husband and I have been reminded — at times quite painfully — what it’s like to be new, outside, uninitiated. In the past year, here are three key ingredients I’ve discovered in true hospitality. Even the less-discerning among us can spot a faker a mile away. The smile a little too forced. The voice a little too high. The questions that don’t wait for an answer. The slimy feeling left behind — sticky-sweet, I call it, the kind of hospitality that leaves a residue. If we want people to feel welcomed, we have to be genuinely welcoming. 2) Be the initiator and the pursuer. Simply put, follow up. New people have already made the first move by showing up. Make them feel genuinely welcomed by inviting them out for coffee, texting them to ask about their day, Facebooking them a funny video that reminded you of your recent conversation. Do something honest and tailored, something that allows for a response. Do it more than once. No form letters or cold calls allowed. 3) Earn the right to ask personal questions. Everyone hates small talk, but going zero to sixty can make newcomers feel uncomfortable and caught off-guard. Don’t ask a question you wouldn’t be willing to answer yourself. Take time to build relationship with people. Let depth come naturally. Create space for deep conversation, make the first move, and allow them to share when they’re ready — when you’ve earned their trust. I know how hard it can be to be willing to be uncomfortable, to be the one to break the ice, to leave the circle of familiar friends and open up to someone new. But this past year, being the newcomer at every new church service, every new community event, I have been reminded that it is infinitely more difficult to be on the outside, feeling displaced and excluded — maybe even unwanted. Next time I’m on the end of extending hospitality to someone new, I will remember to be in the habit of being genuine, following up, and earning the right to go deeper. On Wednesday, I contributed to the SheLoves syncroblog on writing love letters to our bodies. This weekend, you guessed it, try writing a love letter to your body. It’s a strange and unusual experience, but you might be surprised what comes out of it. This is a chance to break the refrain that runs through our heads, reminding us what we don’t like about ourselves. Be bold. Be honest. Be funny. Be vulnerable. Embrace the body you have, just as it is right now. Even if you already have a healthy body image, this is a great opportunity to reflect on your unique relationship to your body. It is, after all, the temple of the Holy Spirit, right? Not sure where to start? Check out some wonderful examples on the SheLoves website. Not just for women! Men, you go right ahead and write your body a letter, too. If you feel comfortable sharing, post in the comment box below, or just leave a link to your blog or Facebook post. I’d love to read what you come up with! How do I love you? Let’s be honest, this has not been a love/hate relationship. It’s been more like a hate/ignore relationship. Through the years, we have communicated as little as possible; we were estranged. I wished you did not exist, and at times I wept that I could not be rid of you. I did not trust you. We did not trust each other. I criticized you. I accused you of betrayal. You were always to blame. And then, there was that first glimmer of understanding between us. We had climbed into the boxing ring together, eying each other warily, circling, waiting for the other to make the first move. The bell of awareness rang; our match began. I began to understand, slowly, what you were really all about. Sometimes we were walking together, talking. Sometimes we were back in the ring, full of distrust and circling, circling. You whispered. Then, you shouted. It was so long before I could really listen. Your voice was so loud in my ears. They are still ringing. But we are beginning to understand each other. We are beginning to trust — beginning to begin. I have not stopped believing the lies I believed about you all my life. The truth is so much harder to believe. But I have begun to identify them, slowly. I have begun. We have begun, you and I, to know each other, to listen, to trust. I have begun to let go of the hate and fear, the shame. The shame is the last to go. It is the veil I have worn so long. It covers us both. On Monday we talked about the act of writing it down and on Wednesday about the act of creating art. This weekend, take some time to explore your spirituality and personal growth in a tangible way. 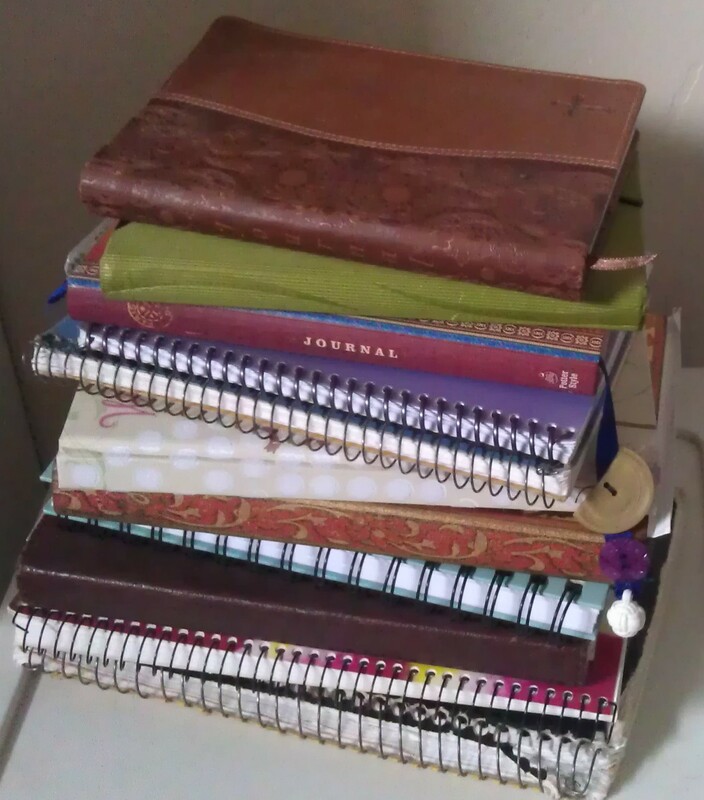 All my journals from the past six years, except one or two I can’t find! Come back and share about your experience in the comment box below. I’d love to see what you create! On Monday we talked about how something happens when we put tangible words on a tangible page, connecting the physical with the mental and spiritual. But not everyone is inspired by words alone. Sometimes we need something even more tangible, even more physical. I don’t pretend to be an artist. I know I am severely lacking in this area and choose to surround myself with artists to make up for my disability. However, in the spirit of friendship with you lovely readers, I will share one of my poor attempts at collage — just to prove that sometimes it is simply the act of creating something physical even more than the finished product that affects us emotionally and spiritually. The finished product below may not affect anyone else, but the act of creating it for me was a quite profound experience of emotional and spiritual breakthrough. I’ll even tell you why. In the act of creating this silly little collage out of scraps from a friend’s art box, I was able for the first time to fully accept myself as a physical being, with all my particular flaws and traits. 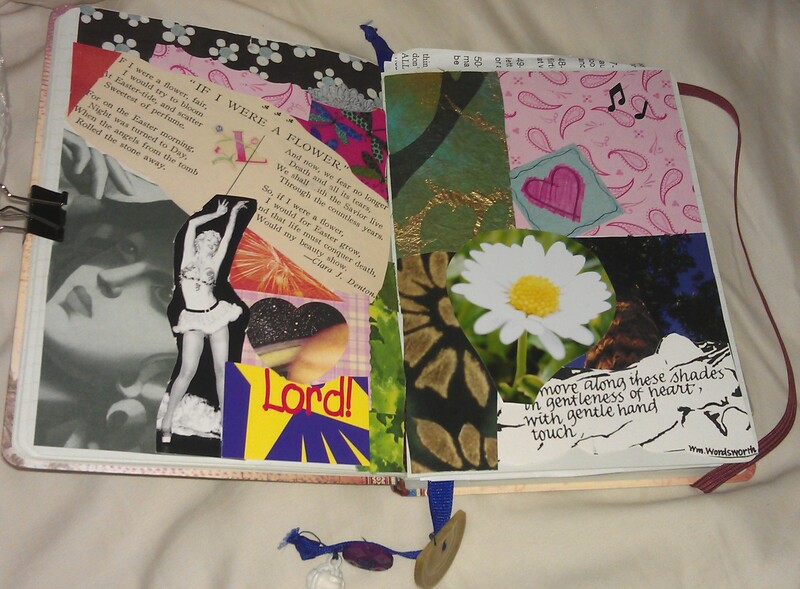 This is a piece of my story, from one of my journals, created my by own hand amongst friends on April 18th, 2009. Something happens when we put words on paper with pen and ink. There is something deeper and more real about forming the letters with our own hands, producing something tangible and lasting. For all the many, many buttons I have pushed to put my intangible thoughts on the digital page, nothing quite captures the something that happens when we truly write the words. This, too, is body theology. 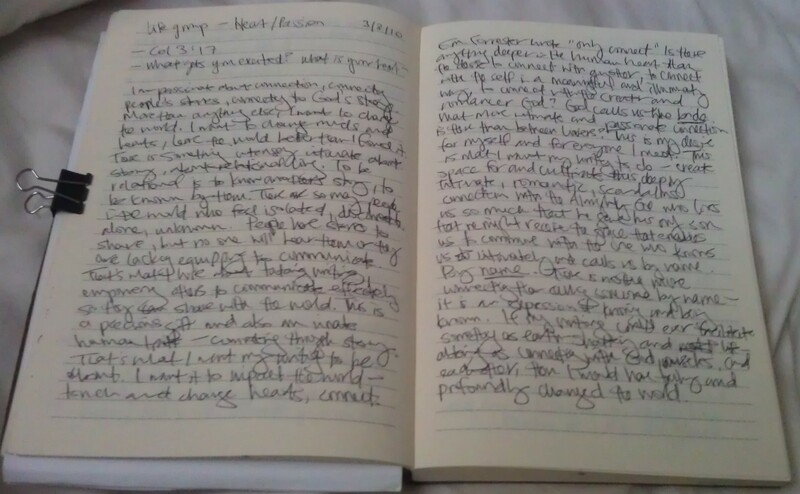 From one of my journals…written in my own hand with pen and ink while amongst friends on March 3, 2010. I am passionate about connection, connecting people’s stories, connecting to God’s story. More than anything else, I want to change the world. I want to change minds and hearts, leave the world better than I found it. There is something intensely intimate about story, about relational living. To be relational is to know another’s story, to be known by them. There are so many people in the world who feel isolated, disconnected, alone, unknown. People have stories to share, but no one will hear them. Or they lack the proper equipping to communicate well. That’s what I love about tutoring writing: empowering others to communicate effectively so they can share with the world. This is a precious gift and also an innate human trait, this connecting through story. That’s what I want my writing to be about. I want it to impact the world — touch and change hearts, connect. E. M. Forrester wrote, “Only connect…” Is there anything deeper in the human heart than the desire to connect with another, to connect with the self in a meaningful and illuminating way, to connect with the creator and romancer God? God calls us the bride. What more intimate and passionate connection is there than between lovers? This is my desire for myself and for everyone I meet. This is what I want my writing to do: create space for and cultivate this deeply intimate, romantic, scandalous connection with the almighty God who loves us so much that God gave God’s only son that we might receive the grace that enables us to commune with the one who knows us intimately and calls us by name. There is nothing more connecting that calling someone by name; it is an expression of knowing and being known. If my writing could ever facilitate something as earth-shattering and life-altering as connecting with God, ourselves, and each other, then I would have truly and profoundly changed the world. Hello, lovely readers! Happy Independence Day! I’ve been a little under the weather and haven’t been able to get anything new up on the blog the last few days. While I’m recovering, I wanted to pass on a few books straight from my very on bookshelf that have inspired, informed and influenced my pursuit of balance — practically, theoretically, intentionally, unintentionally. Maybe one or two will do the same for you.